The purpose of the Beer Judge Certification Program is to promote beer literacy and the appreciation of real beer, and to recognize beer tasting and evaluation skills. We certify and rank beer judges through an examination and monitoring process. What are the Style Guidelines? Styles are a convenient shorthand for discussing beer. They allow all those who are tasting and describing a beer to use a common framework and language. Style Guidelines are designed to assist organizers, entrants and judges participating in beer, mead and cider competitions by providing a standardized set of descriptions of beer, mead and cider styles. 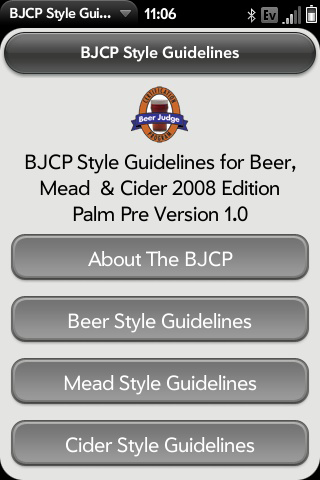 The styles included in the guidelines are not meant to describe every beer style made in the world (at least not yet). They are meant to cover the most common ones entered in homebrew competitions. The style descriptions are based on currently acknowledged world class examples, historical references to styles no longer brewed, and writings of noted beer researchers and journalists. In a competition setting, the Style Guidelines provide guidance to judges so that there is a level playing field for all entrants. Judges and entrants are both using the same descriptions, so the decision on "which beer is best?" is based less on personal whim of the judges and more on how well the entered beer matches world class commercial examples of the style. Style guidelines assist competition organizers by grouping together beer styles of similar characteristic for judging purposes. Judges have an easier time selecting the best beer in a flight if there is as little variation as possible. Grouping beer styles together into categories makes this easier. Category groupings are somewhat arbitrary at times, since some beer styles don't necessarily have strong historical, regional or cultural ties to other styles.